Mystic female cello-vocalist and Akiba-kei Otaku male sound creator formed a “2.5th-dimension phenomenal musical unit″.The duo¸s deep affection to anime/anime songs and their distinctive visual expression is definitely something new. Say you might have seen these two people somewhere before… might have thought they look alike Kanon Wakeshima and kanon of An Cafe? Only in your imagination. They call themselves as intangible products of thoughts, emerging from the 2.5th dimension where lies between the real world (3D) and the world of Anime (2D), to create Anime songs for our enjoyment. 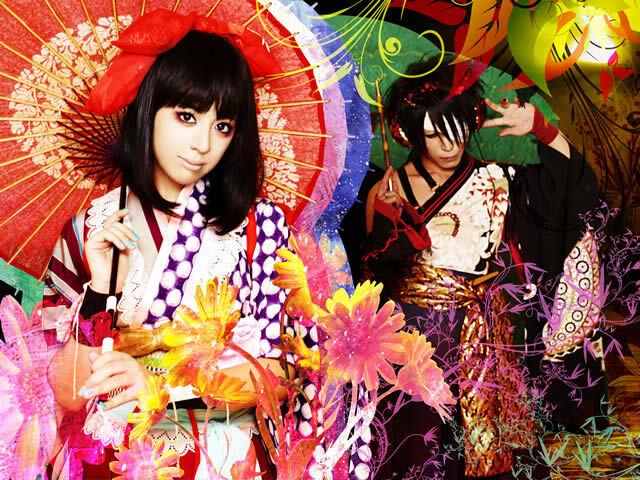 And here the mystery begins with debut single “Calendula Requiem″, which is chosen as the opening theme of Fuji TV network anime Shiki (Corpse Demon), starting October 14, 2010. The fact that they obtained a tie-in project at the startup of their career shows how much attention they are garnering already. Based on kanon x kanon¸s one-of-a-kind, groundbreaking soundscape based on wa (Japanese style), the tune brings anticipation of these two kanons becoming a “made in Japan for the world″ unit… Such potential is inhibited in kanon x kanon. The single is going to be released on November 17, 2010 in Japan. It is also planned to be released in USA (on Nov. 23, 2010) and Europe (date – TBD).